Have you noticed it takes longer to open PDF files? We got a few calls on this and noticed ourselves that recently pdf files started taking a lot longer to open. We receive electronic faxes in the form of pdf files, and I noticed that they took much longer to open starting around a week ago. Bob also noticed that when he double checked quotes before emailing them, they were also slow to open. Several clients also reported similar experiences. The culprit? Adobe Reader "Enhanced Security". This is apparently the result of an update, and the new settings automatically call for Adobe to look up a "policy file" for the document. Of course security is a good thing, but in this case, too much security will slow you down. If you have up to date antivirus protection, anti-malware protection, a good firewall, and you're careful about opening files from trusted sources, this is a case where you probably don't need an extra layer of protection. To revert the settings, in Adobe Reader, go to "Edit" and select "Preferences" from the pull-down. In the "Preferences" window, under "Categories" select "Security (Enhanced)" which is about 3/4 down the list. 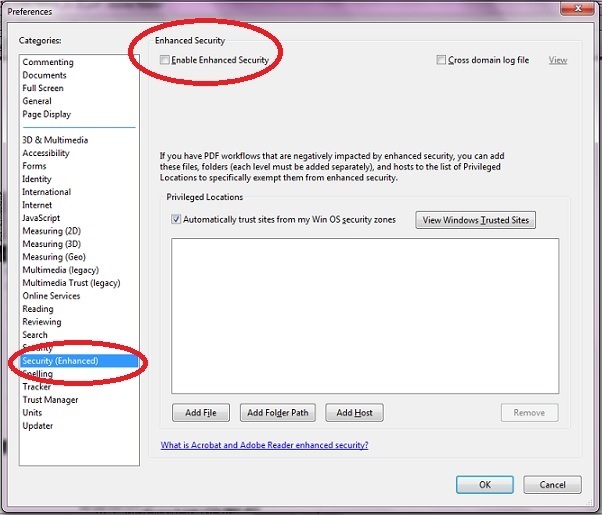 Then un-check the "Enable Enhanced Security" box.